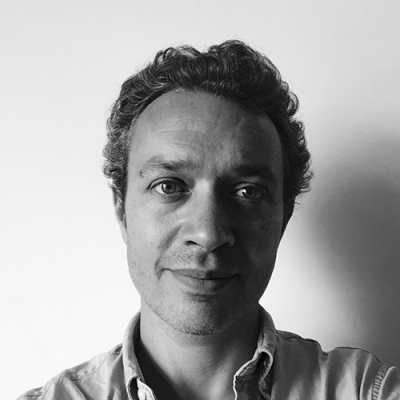 Once again, we’re excited to bring some young readers into the studio (figuratively) to lob some questions at the author/illustrator of a fantastic new children’s picture book. Librarian/reviewer Pallas McCorquodale leads the way with some insightful questions, and then she hands over the questioning to Gabrielle, Odin, Piper, and Chancellor—young readers with very particular things they want to ask Frenchman Guillaume Duprat, the author of Eye Spy: Wild Ways Animals See the World, a new release from What On Earth Publishing. Pallas gave the book a rare star in her review for Foreword’s November/December issue, so rest assured this book is as special as they come. You’ll find the Featured Reviews of the Week further below. 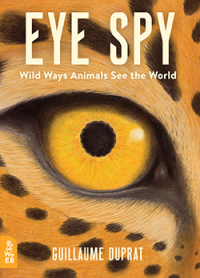 Congratulations to you and to Eye Spy for winning the 2018 Parents’ Choice Gold Award for best nonfiction! The book took years of research and covers a variety of subject areas including ethology, biology, psychophysiology, veterinary studies, optics, physics, and perspective. Are any of these fields that you have studied previously or have experience with prior to researching for Eye Spy? Thanks a lot! From the fields you mention, the only one that I studied in school was perspective. I don’t have a scientific background, but I am passionate about the history of science and scientific theories. When I work on a subject I read a lot of books about it, and then I research the sources of those books—and the sources of those sources—so I read a lot of scientific studies. For me reading scientific studies is as exciting as reading novels is for other people! Aside from my own research, I also get advice from specialists. For this book, I have talked to a friend in Germany who is an excellent ophthalmologist. I asked her to recommend reliable sources about vision. Overall, from the initial idea for the book to completion, it took around two years to collect and understand all of the information needed. Relying heavily on current research in all of these fields, were you ever tempted to conduct your own experiments and observations? I’m not a scientific researcher, I am just curious! I take simple questions and I try to find answers to them. But sometimes I do make simple experiments of my own. When I read scientific studies about pigeons’ field of view, I tried out different positions around the pigeons in gardens around Paris. You can make simple experiments with cats or dogs about color vision or vision at night, too. With snails, you can appreciate their sensitivity to light just by passing your hand over them quickly and then slowly. Did any questions arise during your studies that still have no conclusive answers? The principal question of the book is, what do animals see? This fundamental question is perhaps a bit naïve, but naïve questions are often some of the most deep questions, too. The answer is: in fact we don’t know! Scientists have studied different parts of the question, such as color vision, fields of view, perception of movement, acuity, but they can’t know exactly how this visual information is interpreted together by the brain. And also, animals don’t tell us about their senses! Even for humans, this question can be a difficult one to answer. All animals see with their brain. I have combined the four scientific criteria (color vision, field of view, perception of movement, acuity) with some of my own imagination to draw the different viewpoints in the book. I took big groups of animals such as mammals, reptiles, and insects, and then chose some common animals from each group plus some animals with very different vision to avoid repetition. For example, most mammals do not see red, so I have mostly chosen mammals with different fields of view, and then showed some exceptions like the red squirrel. Sometimes, personal tastes can be important—I did not want to draw an enormous spider’s eyes so I didn’t put a spider in the book! There is a scene that repeats throughout the books: A giraffe, cow, snail, and various other creatures in front of a white building, manicured lawn, and copse of trees. What prompted this layout as the standard? Is the location significant or drawn from a real life view? This scene is very important! It is the common key for understanding the differences of vision between each of the animals in the book. In a way, it is a game—the reader has to look for the differences between the subjective views. The scene is not real! I imagined an ideal scene for revealing the animal’s vision from a unique point of view. From this point of view, you have to be able to see the scene as a bee, a dog, and so on. It is like a scientific theatre in which every object has its own function, in a sense, that is revealed by the view of each animal. In fact we can call this an experience imaginary. It was very complicated, long and funny to imagine. In the scene, there are objects in the foreground, center-stage and in the background, and objects with different forms, patterns and colors. There are even objects that are hidden to human vision, such as the UV colors in the flowers, hidden objects in the water, the reflection of the sky in water, and the distant balloon in sky. 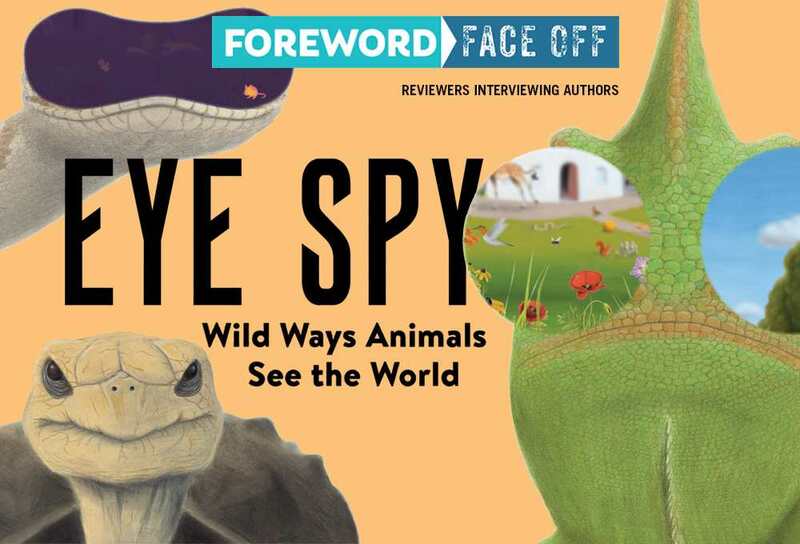 Eye Spy works for a wide range of reading levels. Younger children can sound out the animal names and lift the flap to compare vision, and the data becomes more and more detailed and descriptive as it continues along. Was this a conscious decision on your part to appeal to a larger audience? All my books deal with complicated scientific questions. I try to work on subjects which are mostly unknown to the general public. Each book is like a journey where I feel like I am discovering new things. … There are indeed many levels of understanding. For me, books should follow children’s own experience of life: I hope that children can read my book at any age, sometimes with someone else, such as a friend or adult, and sometimes, six months or two years later, on their own. I look for the adult in the mind of the child and the child in the mind of the adult. All my projects deal with relativity in regard to how we experience the world. For example, I did a book about the different representations of Earth in the history of different civilizations (Le livre des terres imaginées/The Book of Imagined Earths). In my projects about cosmography and cosmology I have observed that vision is very important to humans. So I asked myself, how did the sense of vision develop in animals?, and, do animals have a world of their own? After exploring these questions, I later understood that this was an invitation to explore the question of the interior world of animals. … When you start to imagine the point of view of animals, you start to think of them as subjects, not as objects or just stuffed animals. Are you interested in any of the other senses, like how animals hear or smell things differently? Yes! Yes, a lot! In Eye Spy, exploring the sense of vision was only the first level of understanding. For each animal, I have drawn what they see and given information about what they feel with other senses, as well. This is very important for understanding animals. Animals use other senses for exploring their environment and, most of the time, these others senses are better developed than they are in humans. If an animal does not see well, it means that this animal uses another sense instead. There are a lot of scientific facts included, from exploring how animals see the world to breaking down the particulars of how the human eye works. While delving pretty deep into photoreceptors and ocular minutiae, the tone is still fresh, exciting, and entertaining. Was there a specific process that went into translating the technical terms and phenomena into something fun and accessible for children? Translating scientific concepts for children is hard because you can’t retain all of the information. Sometimes it is a bit like writing a haiku! If you have the impression that the book is fun and accessible, I am very glad, because it is a long process! Plus, if you have that impression, it also means that my English editor did a good job! I live in Paris, a city where nature is a little bit hidden away! So I found images of animals in books, on the web, or in museums. The only exception is the dog, which is a dog from my own childhood: his name was Remus.